Local search is a growing sector, and local businesses cannot ignore the exposure local optimization can offer. With social networks, location check-in services, business listings, review sites, mobile applications and more, local businesses can now secure a portion of online traffic and boost client engagement even without a website and on while on a budget. According to research presented at search industry conference, SMX West 2011, Andy Chu of Bing reported 53 percent of queries having a local intent, with the top categories being movies and restaurants. Bruce Clay has even said that Google will be primarily a local search engine in the years to come. But local search optimization doesn't stop at PC users searching for a business online at home. Local and social search are merging with mobile Internet and applications to offer more ways to for a business to reach its target market. Optimizing for local search without a website can draw not only online traffic, but foot traffic to a place of business. Nearly 100 percent of the suggestions made in this article are free or cost local businesses next to nothing. The catch? A little investment in research and time. But, it's an investment worth making in order to stay ahead of the curve and search engine trends. And it's a fantastic way to increase exposure without having to invest thousands of dollars into a website. Let's take a look at how one local business near Bruce Clay, Inc. headquarters could maximize its exposure online without a website. 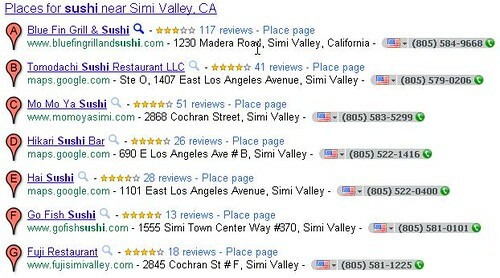 Today we'll examine how Hikari Sushi Bar in Simi Valley, Calif., can do local optimization on a dime. It's unassuming - even uninviting . Hikari Sushi is tucked away in a little strip mall with mirrored windows and doors that don't even offer a glimpse of what's inside during daylight hours. The front of the building is marked simply with giant letters reading "sushi bar." Many people would probably pass by the place without a second glance. 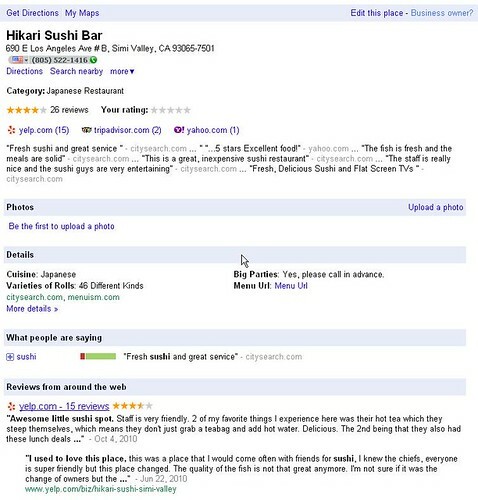 However, Google tells a different story about Hikari Sushi Bar. Its online reviews combined with the fact that Google Places awarded it a coveted "Favorite Place on Google" window decal - one of only 100,000 given away to businesses across the United States illustrates that people love this place. If all of this sounds like Hikari Sushi Bar is doing a great job marketing the restaurant, well it's definitely ahead of the game over many local businesses, but more can be done with its online presence. The restaurant is not capitalizing on all the online marketing tools available to it, and the following sections will outline some of the ways Hikari Sushi Bar can up its game. The list was determined based on the popularity of a business' Google Places listing, as determined by how many times Google users looked for more information about a business, requested driving directions to get there, and more. Google users "decided" based on their actions, and we sent the decals. Hikari made a smart move when they affixed this to their window - even if they haven't yet used it to its fullest potential yet. The window decal features a QR, or "quick response," code. This is a barcode that can be scanned by smartphones and decoded by the user. QR codes are becoming a popular way for progressive businesses to market their products and services or engage with their clients in new ways. After scanning the code on the window decal at Hikari Sushi Bar, nothing unique was presented except for the ability to leave a review on its Places page, which hadn't yet been taken advantage of by patrons. To maximize the benefits of the window decal, Hikari Sushi Bar can follow Google's advice on offering either a special deal to the people who scan the QR code or unique information about the business that they can't find anywhere else. Perhaps they can give tidbits about the history of the restaurant or facts about the sushi chefs and how they became chefs. Or maybe talk about what items on the menu are the favorites of the staff or tidbits about new items and the list goes on. And while on the topic of scanning QR codes, why not incorporate these codes into places inside the restaurant, such as on the table topper or menu. These could also offer special information about the restaurant. For example, Hikari Sushi Bar could give special tips on secret menu items or ways to prepare food items that aren't divulged -- maybe the owner of the restaurant likes his spicy tuna hand roll with eel sauce and paired with a Sapporo beer, or whatever it may be. To create QR codes, look into a QR code generator. Decoding the barcode can be completed through a mobile application, which can be downloaded by smartphone users. At SMX West 2011, Gib Olander from Localeze said mobile users buy within an hour, whereas PC users buy within seven days. With a sales cycle that short for mobile users, offering special discount certificates for menu items that the smartphone user could purchase on the spot after decoding the QR code could be a wise move. 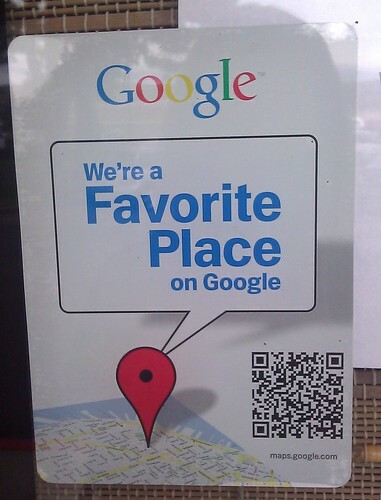 In addition to Google window decals, location-based services like Foursquare has decals, Yelp offers them, too. Rumor has it, even Facebook is jumping into the game as well by creating window decals for local businesses that encourage people to "like" a business' Fan page on Facebook. Staying on the topic of mobile, mobile apps are fast becoming an alternative to searching for and interacting with local businesses. Anil Panguluri of Yahoo! reported at SMX West 2011 that people are using mobile applications almost at the same rate as mobile browsers to complete tasks. With restaurants being among the top-searched local businesses, it only makes sense for a place like Hikari Sushi Bar to make sure it's accessible through popular mobile applications related to restaurants for Android, iPhone and BlackBerry. Doing a quick search for Hikari Sushi Bar on OpenTable.com showed the restaurant was not in the database. What Hikari could do is first make sure the business is listed, so that not only PC and mobile users could make reservations online, but also so the reservation functionality is available to those who have downloaded apps, like OpenTable's app for Android. To expand on that, Hikari Sushi Bar would be smart to make a list of all the popular restaurant directories and mobile applications and ensuring the business listing is included. Check-in, or location-based services not only allow for an additional business listing online (we'll talk about the importance of that later), but also offer a new and social way to connect with patrons. 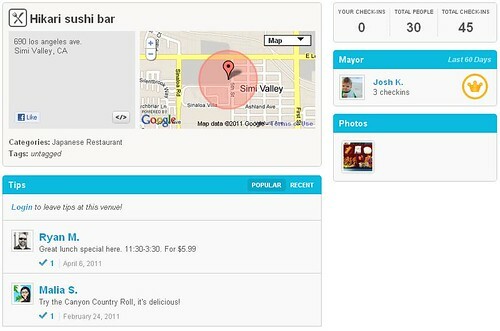 Location check-in services include online properties like Foursqare, Gowalla, Loopt and Brightkite, to name a few. Even social and review networks are getting in on the action, with Facebook and Yelp both offering location check-in and deals. Location-based services allow users to "check in" to their locations via mobile phone and unlock special deals and merits for doing so. In a presentation by Rodney Hess from Search Influence at SMX West 2011, he talked about the concept of "barnacle SEO" - this is the idea of a smaller business attaching itself to a larger online presence and reaping the benefits. Location-based services, says Hess, are indexed by both Google and Bing search engines. That means, a local business without a website can still have a chance of rankings even without a website, simply by claiming a listing in a location service. Businesses can present special deals to patrons while they are at the place of business through check-in services. They can even give special rewards or kudos to those who check in more; for example "mayors" in Foursquare may receive an extra special deal or even honored through special marketing materials at the place of business; newbies can receive welcome deals; specials for friends checking in together might receive an offer; and much more. For a place like Hikari Sushi Bar, it could offer special deals during certain lunch or dinner hours to the people who check in using a location-based service. Using a location service can also draw new business in as well, as people who are on service can see deals happening that are in their vicinity. Hikari Sushi Bar does have a presence in Foursquare with a fair amount of check-ins, but doesn't look like it has claimed its venue. In doing this, it can verify accurate location and start offering specials to its patrons. 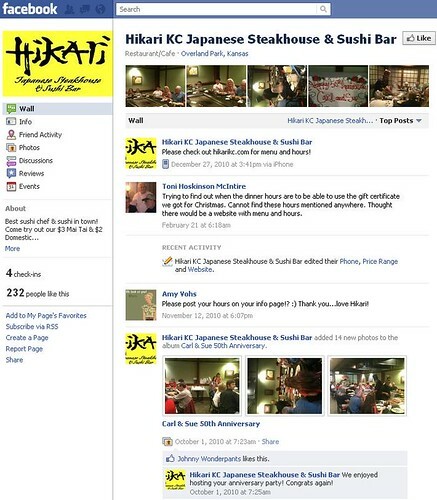 Facebook Deals is another way Hikari Sushi Bar could connect with people. The Deals feature works similar to other check-in services. A company must first claim its Place on Facebook. Hikari Sushi Bar does have a Places page on Facebook with check-ins, but the sushi restaurant is missing out on interacting with these people, and should claim its page so it can start offering deals. Building on Facebook presence, as shown in the screenshot below, claiming a Place page then turns it into a Fan page automatically. Since Hikari does not yet have an official Fan page, this is another important step in optimizing for local and social search online. Plus, there is incorrect information about this business as it stands, with a category listing under "furniture store" in addition to "sushi restaurant." Anyone can edit this information if the business has not claimed it. Keep in mind, Facebook Fan pages also have the ability to rank in search engine results pages (SERPs), offering local businesses additional ways to be found online. And Facebook users can search for local businesses within Facebook as well. A business listing is a profile in business directory like Google Places, Bing Local Listing Center and Yahoo! Local Listing, to name a few. These types of directories sometimes offer businesses more functionality than just a third-party citation. But citations are just as important, especially if a local business does not have a website. For local optimization, citations are likened to link building in organic SEO. A citation is a mention of a business name and its contact information. Yelp, for example, would be considered a citation of a local business. In addition to trusted business directories, search engines such as Google pull information from trusted citations to verify a business. There are about 22 trusted sources online that Google pulls information from about a business to verify it. Some of the more well-known business directories such as Google Places can help a local business to rank solely by having a listing. Making sure a local business' contact information is accurate and consistent across all business listings is crucial in optimizing for local search online. Those 22 sources also feed into hundreds more, distributing that information about a business across many places online. That's why it's crucial that a business' contact information is always accurate and updated any time there is a change. This can be a daunting task for many businesses. This is especially true if the business is already showing inconsistencies in listings due to people other than the business staff inserting information about the company. This happens when a listing has not been officially claimed by the business across various sites. For Hikari Sushi Bar, the information about its business seems to be inconsistent across sites. One recommendation is to use a service like LocalPack to submit and maintain listings online for a small fee. It's less time-consuming for the restaurant to do it this way. Talking citations again, review sites such as Yelp are critical citations. When trying to decipher what's important to Google in local rankings, it's always a good idea to take cues from Google. For example, if top-ranked restaurants have certain similar characteristics in the SERPs, like reviews, for example, then a local business will want to mimic that. In fact, in Bruce Clay's presentation on local search tactics at SMX West 2011, he stated that review sites are among the most critical places that local businesses want to focus on. Since Hikari Sushi Bar is already on Yelp, the next step would be to take control of its listing and unlock the business page in order to access more functionality. Since Hikari Sushi Bar does have a presence on Yelp and several reviews, it's off to a good start. But now, it's time to start maximizing its reviews. While Yelp has said it does not support directly solicitation of review from its users because it could be biased and spammy, the topic is controversial. Many people disagree that asking for reviews is wrong. You can read more about that in Outspoken Media's live coverage of the Up Close with Yelp session. Co-brand your online and print presence with Yelp badges. Our Flickr page is a great resource for these. Printing out marketing materials and prominently displaying them throughout the restaurant serve as a reminder to patrons and gives them another opportunity to interact with the business online. Yelp even gives some tips in its official blog on how to address the not-so-nice reviews that local businesses sometimes succumb to. Hikari Sushi Bar's reviews are mostly positive -- and having a mix of positive and negative reviews is more important in local optimization online than not having any reviews at all - but, it can never hurt to go the extra mile with customer service and address some of those bad feelings. Google Places also offers the ability to review. Scanning Hikari Sushi Bar's QR code on its Favorite Place on Google window decal brings users to its Places page. However, no reviews from Google users exist at the time of this writing. If it did, Google Places also allows businesses to respond to reviews once they've claimed their Places page. If Hikari Sushi Bar wants more reviews via the Places page, it could always leave reminders throughout the establishment, reminding people of the Places page and perhaps even explaining how to use the QR code on the window decal. What we marketers knew as the 7-pack and 10-pack -- that group of local listings that used to show up in Google's results pages -- are no more. Now when searching for something that Google believes has a local intent, the SERPs look very different. Local results vary from query to query as far as layout and type of result (local versus organic), but most of the time, Google Places results are commonplace. With the introduction of Google Places, formerly Google Local Business Center, businesses have another hub online to optimize for maximum visibility and engagement. Google Places is a business listing that can allow local businesses to rank online simply by having a listing. Even if a business has not created a listing, chances are, it's still there. Hikari Sushi Bar has a Place page but has not yet claimed its listing. It's important that local businesses and Hikari Sushi Bar claims their Place page, so they have control over the information and can further optimize the page. Prior to claiming a listing, anyone can edit information about the business - and that can sometimes be bad for business. For example, the business could have incorrect information, such as the wrong category or address, it could hinder the Place page's ability to rank for the type of restaurant people are searching for or incorrectly place it on a Google map. By having control of the Place page, Hikari can take advantage of all it has to offer. The restaurant could upload photos and videos, advertise specials, update information, offer special deals, access analytics-type information and more. Google gives tips on how to take advantage of a Place page in its help center. Universal Search integrates photos, videos, social updates and more into the search results in Google. Optimizing online presence for Universal Search results gives local business another way to be found online, can increase engagement and drive business. For Hikari Sushi Bar, one plan of attack would be to create a YouTube channel. Then the restaurant could make simple videos - even if its just with an iPhone or Android phone - on topics like "how to make a sushi roll," "how to tell if your sushi is good quality," "experimenting with new types of sushi rolls" and "how to take an oyster shooter." These are just a few ideas. And YouTube videos do offer the ability to optimize for search. So Hikari Sushi Bar would want to link to its Google Places page from its videos, as well as add important geotags that include the location of Hikari Sushi Bar in the proper field when uploading the video. More information on how to optimize videos for YouTube can be found in a two-part SEO Newsletter series: Part 1 and Part 2. Creating a branded YouTube channel. Uploading images to a photo-sharing site like Flickr and including geotags of the local business' location among other important keywords related to the business can offer an additional opportunity to rank in online results. 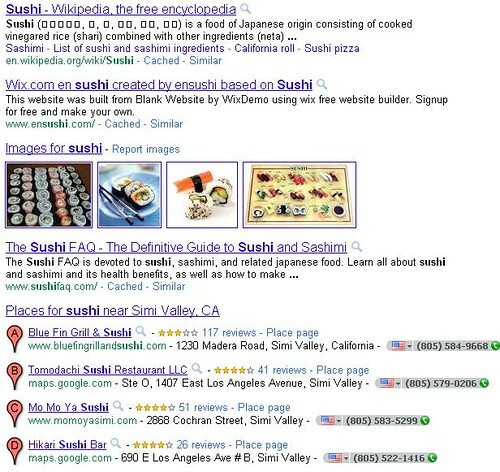 Looking at results in the image below, one can see that images of sushi rank for the query "sushi." Hikari Sushi Bar can take advantage of Universal Search results by upload photos of the business and its food items and optimizing them with location and important keywords. In Flickr, there's also an option to tag the photo on a map to include the exact location of the business. Hikari Sushi Bar could also use Flickr as another outlet to direct people to its Google Places page. 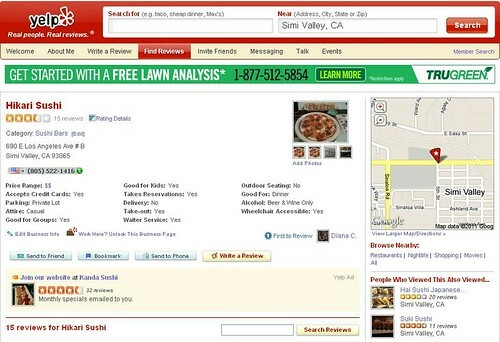 For more on this, an article by Chris Silver Smith on Search Engine Land gives tips on optimizing images for local SEO. While the article is a few years old, it still offers some practical tips. And that's the basics of how to optimize a local business' presence online, on a budget and without a website. The opportunities that are available to local businesses right now online offer endless ways to market to and connect with a target market. It just takes a little creativity and whole lot of initiative.